More TV news and this time it's Toshiba that's announced better-than-last-year TV models in the shape of its new WL968 range. Available in 47-inch and 55-inch sizes, the WL968 TVs are LED-powered and as you might expect offer such televisual delights as 2D-to-3D conversion and YouTube and BBC iPlayer streaming. Expect full reviews of these almost certainly reasonably priced models in due course. Toshiba has also announced a bolstered line-up of 4K TVs. 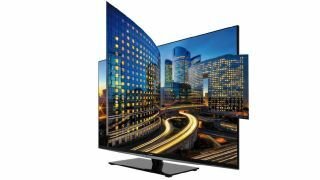 It became the first manufacturer to unveil a 4K and glasses-free 3D TV at IFA last year and this time returns with an enormous 84-inch version to add to the collection. The possibly-named Toshiba 84ZL2 will go on sale some time in 2013 with all sorts of fancy image processing. It's not glasses-free 3D this time though, with Tosh instead opting for the cheaper and frankly less nightmarish passive 3D. The 4K panel at least guarantees full HD image quality when viewing 3D though with 1080 lines of photons blasting into each of your eye sockets. Start remortgaging your house, your family and your souls now – all these enormous TVs are starting to get a bit ridiculous.